Apparently the Swedish have a saying – ‘Man tager vad man haver’ or ‘You take what you have’ which I think is a pretty good rule to live by (see source). Supermarkets have spoiled us for years with imports and the availability of what you want at any time of the year that I would imagine there are people that don’t even understand the concept of seasonal. As I buy my fruit and veg from the market I am often told something isn’t available so I adapt my recipes accordingly but of course even at the market I can still by some things out of season. One of the main things I remember when I was young was having Sunday lunch placed in front of me with boiled new potatoes. Urgh, how I hated them. My young mind couldn’t get around the idea that you couldn’t mash these things so one day my Mum (or was it my Nan) did indeed mash them just to prove a point. So there’s a lot of waffle just because I looked up ‘what are the staples of Scandinavian cooking’. 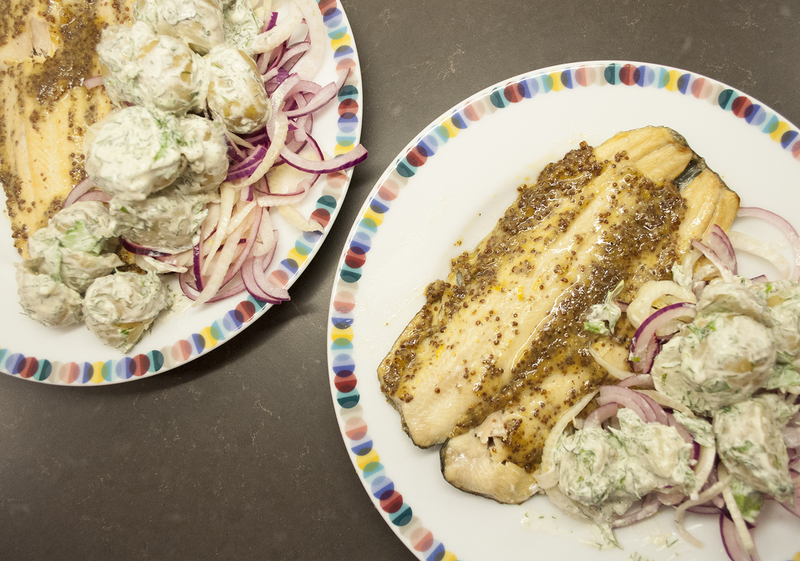 Fish obviously and for me dill and sour cream, is that right? I still don’t know. I do know that this was very good and better than the trout I made a couple of weeks ago. It’s not quite warm enough to sit in the garden and eat a dinner like this with a glass of chilled white wine but that’s how I would have liked it. Cover the onion and fennel with the lemon juice and set aside. Mix half the lemon zest with the mustard and honey and add some olive oil. Line a baking sheet with parchment and pop the trout on. Brush the trout with the mustard mixture and bake in the oven. Probably about 10 minutes. Mix the remaining zest with the sour cream and the herbs. Season well. Stir through the potatoes. You can add the fennel and onion at this stage but I served mine separately. Great & low fat too! Original recipe can be found here. Excellent rule. I should get that printed on table mats. Looks lovely, even the unmasked potatoes 🙂 we are definitely spoiled but I think a lot of people are more mindful of it lately, but still I can’t believe half the produce I could buy now year-round if I wanted to!